Impacts on Australian agriculture of projected climate change are likely to be spatially and temporally diverse, with many regions likely to experience increased downside risk in agricultural production. Some regions, such as south-west Australia, are projected to be particularly at risk of adverse outcomes associated with climate change. The rate and extent of warming, along with impacts on rainfall distributions, are key determinants of agricultural impacts and will affect the success of adaptation strategies. The likely gradual unfolding of climate change should provide farmers in many regions and industries with sufficient time to utilise or develop adaptation strategies. Many of these strategies are likely to be based on farmers’ current responses to climate variability. Investments in R&D and innovation could be important ingredients in facilitating farmers’ adaptation to climate change. Farmers are likely to face additional costs of capital adjustment due to climate change. Investment in long-lived climate-dependent agricultural assets such as irrigation infrastructure, vineyards and agroforestry will become more problematic. Investing in ecological assets in rural regions, especially where these assets may become stranded by climate change, also will be increasingly problematic. Research and commentary on climate change is topical. There is widespread evidence for global warming (Pittock 2003) and the theory of greenhouse warming attributable to man-made emissions has been known for over a century (Ausubel 1983). However, in spite of the general but not unanimous consensus that climate change is occurring or is likely to occur, there is a wide range of views about the nature of the climate change that will unfold (Cline 1992, IPCC 2001a, McKibbin and Wilcoxen 2002). This paper summarises some of the main reports of impacts of various projections of climate change on Australian agriculture. The paper also highlights the key characteristics of projected climate change that will underpin the creation of economic impacts. Then the paper examines the nature of broadacre agriculture in Australia, arguing that its character helps agricultural industries to respond to climate change in a way that either lessens adverse impacts or helps capitalise on favourable changes in climate. Finally the paper offers some concluding remarks. In its most simplistic form climate change is reported (UNEP 1999, AAG 2001) as the shift of climatic zones and their associated agricultural activity toward the poles and to higher elevations. Hughes (2003) points out that a 3°C change in mean annual temperature corresponds to a shift in isotherms of approximately 300 to 400 kilometres in latitude (in the temperate zone) or 500 metres in altitude. The implications of such warming, when combined with altered rainfall, is that in the mid-latitudes yields of crops in some major grain-producing areas (such as the Great Plains of the United States) may be reduced due to more frequent droughts and heat waves (Cline 1992, UNEP 1999). By contrast some currently marginal agricultural areas might benefit from their climate being altered. Applying this simple view of unfolding climate change to Australia suggests that temperate agriculture in Australia will gradually shift its emphasis southwards as it follows the drift towards the higher latitudes of the ‘optimal’ temperate climate (Quiggin and Horowicz 2003). At first glance an initial economic ramification is the likely cessation of temperate farming in regions where farm profits are already highly constrained by low rainfall, high temperatures, high evaporation rates and incidence of drought. Where these farms have few remaining coping strategies then at some stage their permanent adjustment out of temperate agriculture is likely to be triggered. By contrast, farms in locations or altitudes whose profitability is constrained by low temperatures, frost incidence, excess water (eg water-logging, grain sprouting) may benefit from warmer, drier conditions. Although the simplicity of the southwards shift in temperate agriculture is conceptually appealing, and forms a handy simplifying assumption when aggregating impacts, nonetheless simulation and projection studies to-date paint a more complex spatial story for Australia (Howden and Jones 2001, 2004; Howden and Meinke 2003, Harrison 2001, Pittock 2003a, White et al. 2003, Kokic et al. 2005). Further, it is the direct and indirect impact of climate change on the demand and supply of agricultural inputs and outputs that, through market signals, rather than simply altered production possibilities that will also dictate the extent and nature of economic impacts. Not all studies of climate change impacts have consistent findings, in part due to the climate scenarios they consider and the types of modeling assumptions and methodologies and time frames they employ. However, in concert they reveal markedly different impacts of climate change across, and even within regions. These differences are not simply a southwards drift in the prosperity of temperate agriculture. The following paragraphs describe several of these studies that concentrate on physical agricultural production impacts of climate change. Kokic et al. (2005) explore the impact on Australian agriculture of two climate change scenarios. They used estimates of changes in pasture production in ABS statistical divisions as the basis for further estimates of changes in wheat yields and land values. The pasture production estimates were derived from Crimp et al. (2002) who in turn relied on the pasture production model GRASP (McKeon et al. 1982, 1990; Littleboy and McKeon 1997). The two climate change scenarios considered by Kokic et al were based on CSIRO (2001) climate projections and involved firstly, a moderate increase in both temperature and rainfall and secondly, a moderate increase in temperature and a decline in rainfall. The base period for comparison was the interval 1992-3 to 2001-2 and the scenarios were a sub-set of the CSIRO (2001) climate projections towards 2030. For the scenarios involving increasing temperature and declining rainfall, wheat yields and land values in all agricultural industries (crops, mixed and livestock) were projected to decline by roughly between 7 to 16 per cent. By contrast, in the scenario involving higher temperatures and more rainfall, wheat yields and land values were projected to increase by between 2 to 9 per cent. Of particular interest, Kokic et al. found spatial and industry differences for the climatic regime involving warming and a decline in rainfall. Under this regime, although all regions were projected to experience a decline in wheat yield, the southern and western regions of Australia were much worse off, plus the western region experienced a large variation in yield change (see Figure 1). Among agricultural industries the same climate regime particularly adversely impacted on the land values of cropping farms whilst livestock farms were projected to experience a lesser expected decline in land values and less variability in the decline. Figure 1: Percentage declines of wheat yields under a climate change scenario of warmer, drier conditions towards 2030. Howden and Jones (2004) report how the value of Australia’s wheat production could be affected by a projected climate regime towards 2070. Response surfaces of mean wheat yields to CO2, rainfall and temperature were developed for 10 sites representative of the wheat growing regions of Australia. The wheat simulation model I_Wheat (Meinke et al. 1998, Asseng et al. 2004) was run for a factorial combination of CO2 increase, rainfall and temperature change using modified 100-year climate records (Reyenga et al. 1999) to generate response surfaces at each site. Their results suggest that the projected climate regime towards 2070 poses a significant risk for the Australian wheat industry, although adaptation strategies could substantially reduce this risk. Figure 2 illustrates their main findings, showing the value of adaptation responses and the possible impacts of a projected climate change towards 2070. With no adaptation, the changes in yield in addition to changes in price associated with altered grain protein content result in effectively no change (-0.3 per cent or -$15 million per annum) in median national wheat crop value (Figure 2a). However, there is a marked leftwards skewness of possible impacts with the gross value of wheat production potentially falling by up to 49 per cent but increasing by only 10 per cent. Including adaptations of changing varieties and changing planting windows (to take advantage of reduced frost risk) largely offsets the negative impacts of climate change and enhances positive aspects (Figure 2b), resulting in the median value of the national wheat crop increasing by 5 per cent ($190 million per annum) with a range from –25 to +16 per cent. The value of adaptation at a national level (i.e. the difference between Figures 2b and 2a) ranges from $100 million per annum to $550 million per annum with a median of $225 million. Figure 2. Change in national gross value of the wheat crop from historical baseline values (%) for the year 2070 as a result of increase in CO2 and change in temperature and rainfall a) without adaptation and b) with adaptations of changed planting windows and varieties. Howden and Jones’ 2070 projection is for a 5 per cent increase in the median value of the nation’s wheat crop. However, due to the projected rise in Australia’s population and increased use of feed grains in feed-lot and intensive agriculture, Howden and Jones forecast the value of Australia’s wheat exports to decline substantially, even assuming farmers react through adaptation (see Figure 3). The leftwards skew of the distribution reveals prospects for substantial declines in wheat export revenues towards 2070. Figure 3: Change in value of wheat exports ($mill) for the year 2070 when adaptations are practised. The findings of Howden and Jones (2001, 2004) also show marked spatial variation across the 10 sites that underpinned their study (see Table 1). Hence, not only do Howden and Jones project a skewed range of national impacts but also a marked spatial variation in possible impacts with wheat production in south-western Australia being deleteriously affected while southern Queensland and higher rainfall regions of New South Wales benefit.ACG (2005) in a study commissioned by the Australian Greenhouse Office considered the impacts of climate change in seven regions of Australia, selected due to their potentially large adverse impacts of climate change. The agricultural regions they included were the Murray-Darling Basin, the south west of Western Australia and the rangelands of Australia. In developing their findings they drew on previous analyses relevant to those regions (CSIRO 2001, Jones 2001, IOCI 2002, AGO 2002, Pittock 2003a). Table 1: Spatial impacts on the value of wheat production at 10 regional sites in Australia of a projected climate regime towards 2070. Mean regional production reduced by 3 to 15%, with a 52 to 90% chance of production being below current levels. Mean value of production reduced by $13M to $104M per year with a 52 to 97% chance of being below current levels. Mean regional production increased by about 6% but with an 18 to 25% chance of being below current levels. Mean value of production increased by $10M to $15M per year with a 25 to 27% chance of being below current levels. Mean regional production increased by about 12% but with a 5 to 14% chance of being below current levels. Mean value of production increased by $15M to $24M per year with a 13 to 14% chance of being below current levels. Mean regional production increased by about 9% to 13% but with a 0 to 8% chance of being below current levels. Mean value of production increased by $13M to $24M per year with a 1 to 4% chance of being below current levels. The ACG reported CSIRO modeling for the Murray-Darling basin that projected stream flows to decline by up to 20 per cent by 2030 and up to 45 per cent by 2070, although much variation surrounded these projections. ACG forecast problems of water shortages and increased competition for water. This issue is of particular concern as the Murray Darling Basin is a major source of runoff in southern Australia (see Figure 4). The basin and its runoff support a range of agricultural industries, towns and Adelaide depends on the basin’s runoff for some of its water supply via the Murray river. Within the basin are around 30,000 wetlands dependent on run-off and the bulk of Australia’s irrigation area is also within the basin. Drought frequency and its severity within the basin are also projected to increase with adverse impacts on rural businesses, infrastructure and greater loss of soil and biodiversity is expected. Drought impacts could accelerate woody weed invasions. ACG also reported on the south west of Western Australia. They suggested that this region is likely to already be experiencing the impact of climate change with its winter rainfall having decreased by 10 to 20 per cent over the last 30 years and having experienced an overall warming of its daily temperatures. Further declines in rainfall are expected to greatly reduce plant production, affecting crops and pastures and reducing the productivity of animal production. Similar findings were generated by Van Ittersum et al. (2003) who used APSIM (McCown et al. 1996) to review how changes in CO2 concentration, temperature and precipitation might affect wheat production (the main crop) in Western Australia. Their results suggest that moderate temperature increases (up to +3 °C) together with elevated CO2 levels at ambient rainfall levels can have positive effects on wheat productivity in Western Australia with decreases in grain yield being offset by extra nitrogen fertilization. However, they note that if precipitation does decrease, which most climate models suggest is likely, then wheat yields will decrease substantially. Their findings suggest a possible contraction of the Western Australian wheat belt under climate change scenarios towards 2070. In the rangelands of Australia, ACG reported that changes in flood and drought patterns will generate a range of spatial impacts. In southern rangeland regions where rainfall is anticipated to decline, animal production will commensurately decline through reductions in carrying capacity. The converse is likely to apply in northern rangelands. Howden and Hayman (2005) examined the impact of projected climate change on the Goyder line in South Australia. This line historically has represented the border of cropping viability. They show (see Figure 5) the large uncertainty about the future position of this line, with there being a small probability of the line moving inland yet a higher probability of it moving south or coastwards, thereby reducing the area viable for cropping in South Australia. Figure 5: Possible climate change-induced change in the position of Goyder’s line in South Australia. The impact of climate change on cropping area was also investigated in an earlier study by Reyenga et al. (2001). They noted that climate change would likely alter the distribution of cropping in Australia, given the importance of climate and soil characteristics in determining average yields and the frequency of failed sowings. They suggested that the viability of some cropping regions across Australia would decrease if the number or sequence of poor seasons increased. Davison et al. (1996) assessed the response of dairy cattle to heat stress in New South Wales and Queensland and catalogued a range of adverse impacts. Howden and Turnpenny (1997) and Howden et al. (1999b) report on impacts of heat stress and climate change on northern beef cattle in Australia. According to Petty et al. (1998) heat stress already affects the productivity of northern cattle. Moreover, Norris et al (2003) reviewed all cattle deaths on voyages from Australia to all destinations between 1995 and 2000 and found that Bos Indicus cattle coped with hot, humid conditions on board ships better than Bos Taurus. The Bos Taurus, the common species in temperate regions, had higher respiratory rates, higher death rates and were particularly susceptible to heat stroke. Most climate models forecast warmer conditions with the implication that dairy and beef cattle will experience even greater heat stress, causing greater mortality and limitations on productivity. Howden and Turnpenny (1997) advocate further selection of cattle lines with greater thermoregulatory control, but they point out that this could be difficult because it may not be consistent with high production potential (Finch et al. 1982, 1984). McInnes et al. (2003) have commented on possible impacts of climate change scenarios on Australia’s viticultural regions. Warmer, drier conditions particularly in winter and spring are likely to accelerate phenological development, causing earlier ripening and possible reductions in quality. However, in cooler climates such as the Mornington Peninsula in Victoria, and in Tasmania, warming may allow new varieties to be grown. In all viticulture regions there will be greater competition for increasingly limited supplies of irrigation water. As vineyards have a life of 30 years or more, vines planted now are likely to experience climate change, so varietal selection and management may need to account for these impacts. Regarding agro-forestry, the productivity of exotic softwood and native hardwood plantations is likely to be increased by CO2 fertilisation effects, although the amount of increase is limited by various acclimation processes and environmental feedbacks through nutrient cycling. Where trees are not water-limited, warming may expand the growing season in southern Australia, but increased fire hazard and pests may negate some gains. Much uncertainty remains surrounding the likely impacts of climate change on plantation and agro-forestry (Pittock 2003a). Some studies of climate change do not report directly on agricultural production but nonetheless describe issues that do have implications for agriculture. For example, Beer and Williams (1995), Williams et al. (2001), and Cary (2002) report the potential impact of climate change on bushfire danger in Australia. These studies each found a general increase in fire danger, as measured by the McArthur forest fire danger index, with the enhanced greenhouse effect. Extreme fire danger is highly correlated with periodic drought conditions, leading to drying of fuel, and extremely hot summer and autumn days are conducive to fire spread. Both these conditions are expected to increase with global warming under all plausible scenarios, at least in southern Australia (Pittock 2003a). Demographic changes related to climate change will also affect the pattern of regional demand for agricultural products. Because Australia’s coastal fringe is less likely to experience the magnitude of climate change as projected for inland areas, its relative climatic attractiveness will increase, thereby affecting demographic shifts and altering the regional demand for agricultural commodities. Climate change has a number of characteristics that will affect the nature, extent and timing of its agricultural impacts and these characteristics will underpin or be the focus of investigations of climate change by agricultural economists and others. The following sub-sections outline those characteristics and briefly explore their importance. Firstly. climate change involves the unfolding of a physical trend that will impact on physical and ecological systems, such as farming, and its related agro-ecological systems. The main physical trend for many parts of Australia, about which there appears consensus, is the emergence of a warmer, often drier climate with enhanced CO2 levels, although uncertainty surrounds these trends (Jones 2003). annual average temperatures are projected to increase by 0.4 to 2.0 °C by 2030, and 1.0 to 6.0 °C by 2070, relative to 1990. Associated changes are increases in potential evaporation and heatwaves, and fewer frosts. Warming is expected to be greater inland than near the coast. Annual rainfall is projected to decline in the south-west of Australia in the range of –20 to +5 per cent by 2030, and –60 to +10 per cent by 2070, while in the south-east changes of –10 to +5 per cent by 2030 and –35 to +10 per cent by 2070 are projected. In other parts of northern and eastern Australia increases or decreases in rainfall are possible, depending on locality. However, when rainfall changes are combined with increases in potential evaporation, a general decrease in available soil moisture is projected across Australia, with droughts likely to become more severe. Downside risk in agricultural production is projected to increase. Most regions are projected to experience an increase in the intensity of heavy rain events and the frequency of other extreme events such as floods, fires and high winds will increase. The likelihood of more extreme events (particularly drought and heat stress) arises from the distributional impacts of an increase in mean temperature as well as the possible increase in temperature variation (IPCC 2001a). The effect of global warming on the incidence of extreme heat is illustrated in Figure 6. For a normally distributed variable such as temperature a small increase in its long-term mean, and/or variance, can produce substantial changes in the probability of occurrence of extreme heat. For other variables that may not necessarily be well-approximated by normal distributions, like frost or precipitation, the situation is even more complex, especially for dry climates. For precipitation, changes in the mean total precipitation can be accompanied by other changes like the frequency of precipitation or the shape of the distribution including its variability and therefore the probability of occurrence of precipitation extremes. 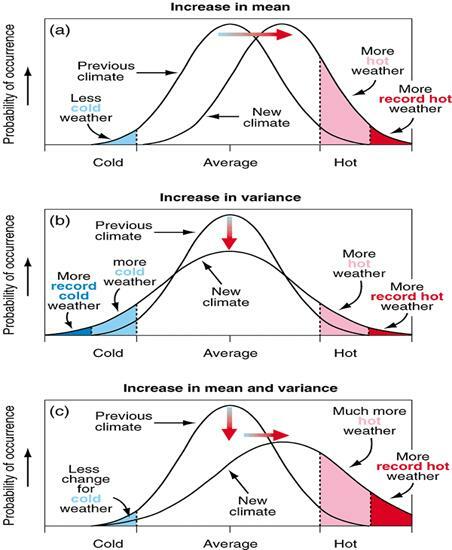 Figure 6: Illustration of effects on extreme temperature when (a) the mean increases, leading to more record hot weather, (b) the variance increases, and (c) when both the mean and variance increase, leading to much more record hot weather. As outlined earlier in this paper, climate change projections involve non-uniform spatial and temporal impacts. Although the trend is for the Australian agricultural environment to become warmer and subject to more frequent extreme events, the projections for change in rainfall amounts and patterns are highly variable and different across regions. Even in a relatively small region like Gippsland in Victoria, Hood et al. (2002) reported that climate change will affect its different agricultural activities in diverse ways over time, favouring some activities while adversely affecting others. The temporal aspects of climate change are especially important, yet are a feature about which there is great uncertainty. The rate of change in climate is important as it affects the capacity and ease of natural and built environments to adjust or adapt to climate change and it affects the profitability of the adjustment response. Quiggin and Horowicz (2003) point out that agricultural adjustment costs will be increased where climate-dependent long-lived assets depreciate too slowly in the face of climate change. Examples of such assets they consider are water supply and grain storage and handling infrastructure. Adjustment costs can take different forms. Capital losses can occur through over-investment in assets whose service life is reduced through climate change that causes these assets to be stranded or under-utilised. For example, large long-lived capital investments in grain handling and storage can become redundant or under-utilised in regions where climate change leads to grain production declining or, in extreme cases, ceasing. Conversely, additional capital costs can be incurred if an initial capital investment is rendered inadequate due to impacts of climate change. For example, initial investments in water storage on farms may prove inadequate in the face of warming and drying trends, triggering additional expenditure on water storage assets. Another aspect of the rate of climate change is its impact on the natural environment (Quiggin and Horowicz 2003). Natural environments, including remnant bushland on farms and nature reserves in rural districts, represent a fixity of land use and, in the face of climate change, risk being stranded assets whose ecological value is degraded by climate change. The patchwork of remnant bush, in the absence of linking corridors, exposes these natural assets to ecological loss and prevents natural ecological succession. In some situations the possibility of species extinction is enhanced. Even where ecological succession is facilitated by the linking of reserves to traverse isohyets and isotherms, the natural rate of species’ movement and succession may be inadequate if the rate of climate change is sufficiently high. Where climate change is rapid, adjustment costs can feature as an important component of the costs of climate change. In static analyses of climate change these dynamic adjustment costs are typically overlooked and therefore these analyses can understate the costs associated with climate change. The rate of climate change can also affect the returns to agricultural R&D, where investments are climate-dependent and have long lead times or long pay-back intervals. For example, developing or selecting new crop and pasture species, varieties and animal lines can take decades or at least several years. However, a high rate of climate change could reduce the likely profit stream from these innovations as eventually these innovations will be grown or used in climatic regimes to which they are less suited. Often productivity gains involve small increments that in turn depend on R&D findings from R&D projects funded several years, if not decades, earlier (Alston and Pardey 2001, Pardey and Beintema 2001, Mullen 2002). One impact of climate change is to lessen the potential relevance to a region of previous R&D conducted in that region as the previous R&D is based on a climate pattern no longer as relevant to that region. In this case, regionally-specific R&D knowledge is also a stranded asset. One consequence is that productivity gain may be reduced through adoption of innovations developed for a former climate regime no longer as relevant to the farmer’s decision environment. The rate of climate change can also affect the value of local and regional knowledge about season types and frequencies. The stochastic and dynamic nature of climate change erodes the informational value of historical local climate observations. Climate change is likely to generate new types of seasons and alter the frequency of weather-year types. Farmers and others who rely on historical information for their decision-making will find such information less relevant in the face of rapid climate change. Large global warmings are acknowledged as triggers of large-scale discontinuities in the climate system (Stocker and Schmittner 1997, Fagan 2004). Determining the timing and probability of occurrence of such discontinuities is difficult because these events are triggered by complex interactions between components of the climate system. Often, the discontinuous impact can lag the trigger by decades. Several studies have identified the importance of such events to global estimates of risk, and in cost/benefit analyses of mitigation action to reduce climate change impacts (Keller et al., 2000; Baranzini et al., 2002; Vellinga and Wood, 2002; Azar and Lindgren, 2003; Howarth, 2003; Tol, 2003). Often regional studies overlook abrupt or discontinuous impacts of climate change yet, in spite of their likely low probability and distant nature, nonetheless the discounted present value of these events (if large enough) can be substantial. Non-linearities are a feature of climate change (Rial et al. 2004). The importance of non-linearities in climate impacts can be illustrated by a runoff equation. and C is the Soil Conservation Service (1986) curve number with C = [1,2,3…,100]. The curve number is based on the soil type, ground cover, and other factors (McCuen 1982). The implications are that a proportional reduction in precipitation will have a larger proportional impact on runoff. The non-linearity of the runoff function has major implications for rain-fed water supplies in Australia. For example, DEP (2004) reported on the possible impact of a projected change in climate on the water yield of the Stirling Dam catchment, located in the south-west of Western Australia. They found that an 11 per cent reduction in annual rainfall by the middle of this century could likely result in a 31 per cent reduction in annual water yield. Their results were based on 40 current (1975 to 2004) and 40 future (2035 to 2064) statistically downscaled daily rainfall series generated from CSIRO modeling. The projected change in catchment runoff was then simulated using a catchment model calibrated under existing conditions (Bari et al. 2005). 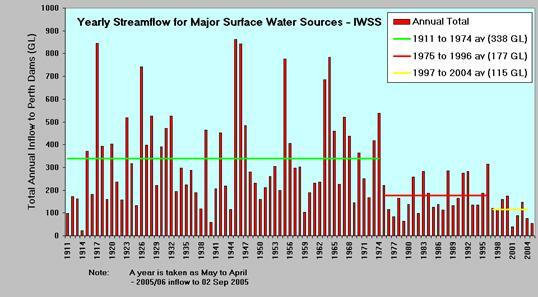 Similar findings have been reported by IOCI (2005) who note that annual rainfall in the south-west of Australia has declined by 10 per cent since the mid-1970s yet stream flow has declined by over 40 per cent since the mid-1970s and in very recent years by over 60 per cent (see Figure 7). Whether reductions of this size are attributable to climate change impacts or are simply mostly a feature of long-run climate variability is the subject of current research (IOCI 2005). Another important non-linearity in climate change impacts was pointed out by Quiggin and Horowicz (2003). They postulated a model of climate change impacts and showed that damages associated with climate change were a convex function of the rate of warming, causing the expected damage level to be greater than the damage associated with the expected rate of warming. A corollary is that studies based simply on the expected rate of warming will understate the expected damage. The non-linear and stochastic nature of the damage function will mean the likely costs of damage from climate change will be greater than in the case where a point estimate based on the expected rate of climate change is used in estimating the damage cost. Quiggin and Horowicz (2003) point out that uncertainty implies losses over and above those associated with the convexity of the damage function associated with climate change. They comment: “The fact that the effects of global change are highly uncertain, especially at a local level, implies losses that are independent of risk-aversion or convexity of the damage function.“ (p.444). Farmers facing climate change uncertainty will make investment decisions that ex post will be sub-optimal. For example, some farmers who experience a favourable sequence of seasons may make large investments (e.g. cropping gear) in the hope that the frequency of such seasons is unchanged. However, if climate change greatly lessens the frequency of such seasons then those farmers may regret their investments. Conversely, if the rate of climate change is very slow and the frequency of favourable seasons is unchanged then farmers who did not make the farm investments may also find they regret not making those investments. The stochasticity of climate change, and the projected increase in extreme events, will affect not only farmers’ investment decisions but also the portfolio of innovations demanded by them. Providers of agricultural R&D will need to develop innovations that are profitable across a wider array of weather-year types or which perform in extreme conditions. Animal lines and plant varieties, for example, may need to better withstand heat stress. Low-cost design and construction of contour banks may be needed to reduce soil loss associated with infrequent yet intense rainfall events. Often climate change is reported in terms of projections of changes in mean temperature, annual precipitation and/or CO2 levels. To understand the agricultural impacts of these changes often studies focus on one or some of these changes. Hence, it is not unusual for studies to report different impacts depending on whether or not warming only or warming and rainfall changes are considered. Even where many climate ramifications are represented in agricultural models (Hall et al. 1998, Howden et al. 1999, Howden and Hayman 2005), output from these models is still subject to uncertainty. As discussed by Morison (1996), the accuracy of these models’ predictions often relies on localized data sets that are yet to be available regarding climate change. Further, these models may overlook or not yet include factors that may importantly affect agricultural production. For example, models are often not linked to pest and disease modules yet climate change is likely to affect the pest threat to crops. Most crop growth simulation models do not include impacts of ozone, yet ozone pollution is detrimental to vegetation and therefore affects forest and crop productivity. Many parts of China, Europe and the United States have emerged as regions where very high ozone levels occur and crop production and carbon sequestration are forecast to suffer (Mauzerall and Wang 2001, Felzer et al. 2005). Yet most crop production studies ignore the impacts of and changes in ozone levels. Lastly, there are a range of adaptation responses by farmers that affect the eventual impacts of climate change yet simulation production models may not capture or include the majority of these adaptation responses that influence crop and pasture production. Complex interactions within and between enterprises and ecosystems are likely to be affected by climate change. Understanding and anticipating how climate change may affect these systems is a difficult task yet their ultimate impact on agricultural production could be important. The other feature of complexity is the impact of climate change on national and international commodity markets. Even if a region is not subject to climate change nonetheless the prices it receives for its traded goods will be affected by the impacts of climate change on agricultural production in other regions or countries. Understanding how climate change will affect the demand and supply of nationally and internationally traded goods is an enormous task (Reilly et al. 1994, Rosenzweig and Parry 1994, Fischer et al. 2002, Julia and Duchin 2005) with simulations to date showing a variety of spatial and regional impacts. socioeconomic impacts including management responses to altered production relationships, changes in relative costs and the management responses to changing demands for goods and services. In short, the impacts of climate change will not just be physical impacts on agricultural production processes. Rather, a complex unfolding set of influences, including altered market prices, will emerge that will dictate the nature and extent of economic impacts on Australian agriculture. The commonly identified source of human-induced climate change is emission of greenhouse gases from use of petroleum and coal, ruminant production and land clearing. The major sinks for these greenhouse gas emissions are the atmosphere and oceans that historically mostly have been subject to open access (Congressional Budget Office 2003). Yet population growth, industrialisation and advances in technology are making these resources vulnerable to overuse and degradation (i.e. the tragedy of the commons). To reduce greenhouse gas emissions by establishing pollution rights may not be feasible due to large transaction costs. Emissions come from regions across the globe, and their effects are likely to be borne throughout the world by successive generations. Moreover, some of the impacts of climate change ― the disruption of ecosystems and extinction of species are themselves public in nature. So defining rights and responsibilities for the human activities that contribute to climate change is a challenge. Certain types of rights, such as rights to emit greenhouse gases by burning fossil fuels, could be formed without great difficulty. Other rights, such as credits for carbon stored in the soil and trees of a forest stand or in the ocean, would be more complicated to define. So policymakers are faced with a difficult national and international task of helping manage a resource that no one owns, that everyone depends on, and that provides a wide range of very different costs and benefits to different people in different regions over very long periods, and for which property rights would be difficult to define, agree on, and enforce. Effective management of the atmosphere regarding climate change involves balancing the marginal benefits of using it as a sink for greenhouse gas emissions against the marginal costs of the climate change that may gradually result from the incremental emissions. Balancing current costs and future benefits also includes weighing the cost of reducing emissions to avert climate-related problems in the future against the cost of adapting to the climate change that occurs--that is, balancing mitigation and adaptation. If the incremental costs of reducing emissions today are higher than those of adapting to the consequences of emissions in the future then it would be more cost-effective to reduce emissions less and to adapt more. In the absence of effective policy or cost-effective technological solutions for mitigation then the future for many farmers is more likely to involve living with and adapting to climate change. The nature of farm businesses in Australia affects both their exposure to the risk of climate change and their ability to adapt to climate change. Currently, many farm businesses in Australia have high equity, both in aggregate and percentage terms. Farms are often diversified with portfolios of on-farm enterprises and off-farm investments (Martin et al. 2005). Larger businesses often are additionally spatially diversified (MacKay 2005). Kingwell and Pannell (2005) point out that this diversity has enabled businesses to cope with variation in climate and to capitalise on changes in the relative prices of agricultural commodities. It has enabled generations of farmers to be equipped with a range of management skills, created flexibility, and supported entrepreneurial action. Accompanying this diversity in revenue sources is a skewed distribution of wealth and farm size. For example, in Western Australia where already evidence of climate change may be emerging (Sadler 2002) grain delivery data reveal that around 14 per cent of grain growers deliver over a third of the State’s grain and that a quarter of grain growers deliver over 54 per cent of the State’s grain. Similarly, over the period 1997–98 to 1999–2000, WoolDesk data reveal that approximately 14 per cent of woolgrowers in Western Australia produced half of the State’s wool (Kingwell and Pannell 2005). The skewed distribution of wealth and production within the farm sector does have implications for the sector’s response to climate change. Very large businesses may be better able to spatially diversify to capitalize on or mollify climate change and climate variability impacts. These businesses (e.g. rangeland beef production and finishing) may utilize spatial diversification and enterprise specialization within integrated supply chains (MacKay 2005), combined with economies of size and scope, to lessen the adverse impacts of climate change. For much smaller businesses, opportunities for spatial diversification may be much more limited and these businesses may be restricted to on-farm and local responses to climate change and climate variability. In spite of the potentially large long run impacts of climate change for Australian agriculture, nonetheless, for most farm businesses, even large businesses, climate change is unlikely to be a first-order issue. The commercial longevity of most farm businesses depends on their financial performance in the next few years rather than the more distant impacts of climate change, so it is rational for farmers to devote their energies toward the more pressing commercial issue of appropriately responding to the climate variability and market opportunities over the next handful of seasons. Only when dealing with issues of farm succession or farm expansion may climate change impacts surface, and even then, perhaps only in passing. For example, if climate change is likely to unfold and affect agricultural productivity in a region then part of the succession discussion may be the wisdom of selling up rather than inheriting a land asset whose productivity could be gradually eroded by climate change. Similarly, for farm expansion the discussion may include the wisdom of shifting to or purchasing additional land in a region less exposed to adverse climate change. However, in many situations, the rate of climate change may be so slow as to have virtually little impact on the discounted present values of profit streams. Further, there may be no reliable information about the timing and size of climate change at a local or regional level upon which to base a purchasing or selling decision. Even where adverse climate change impacts may already be evident, as perhaps in south-west Australia, it may still be the case that R&D innovation may more than offset these impacts. In south-west Australia, for example, declining rainfall and warmer temperatures have been observed since the mid-1970s (Foster 2004). However, in spite of what, in biological terms, appears to be a worsening environment, wheat yields have trended upwards. Further, as reported by Knopke et al. (2000) and Alexander and Kokic (2005) annual average total factor productivity growth was highest for grain farms in the Western Australia, at around 3.5 per cent for the 21 years to 1998-99, compared with 3.2 per cent in the nation’s other southern region and 3.0 per cent in its northern region. Grain yields also rose the fastest in Western Australia over this period. These findings reveal that adverse climate changes may not necessarily translate into adverse commercial or economic impacts. As illustrated later in this paper, the situation in south-west Australia reveals that the combination of R&D innovation, market conditions and adaptation responses of farmers can overcome or ameliorate possible adverse impacts of some change in climate. The extent to which such favourable outcomes can be generated in this and other regions depends on several factors, including the rate and extent of climate change and the availability and suitability of adaptation responses. development of varietal portfolios suited to greater weather-year variation. In particular, developing varieties with greater drought tolerance, heat shock tolerance, resistance to flower abortion in hot/windy conditions, resistance to new or more virulent pests and diseases. The findings of John et al. suggest that, even in the absence of new technologies and enterprise options, farmers would adjust and adapt to climate change by altering their existing mix of enterprises, changing rotations across soil classes, altering stocking rates, and changing feeding regimes and livestock flock structures. However, in spite of these profit-enhancing adjustments, farm profitability in the study region was projected to decline by up to 50 per cent or more in worse-case scenarios, compared to historical climate. The main factor influencing this decline in farm profit was the decrease in crop production as a result of declining crop yields given the increased frequency of dry weather years and the reduced frequency of very favourable weather years that reduced the contribution to expected farm profit from tactical alterations in the enterprise mix in these favourable years. Their analysis revealed the substantial size of the technical and financial challenge posed by possible climate change for the study region which was already subject to low annual rainfall and bordered the margin of cropping in south-west Australia. However, if the rate of climate change is slow enough then crop varietal development and agronomic and management innovation will cushion adjustment costs and reduce the projected decline in farm profit. One other finding of John et al. is that adverse climate change is projected to reduce the financial capacity for adoption due to reductions in financial liquidity. Hence, expensive, lumpy capital investments (e.g. cropping gear, additional farmland) may be difficult to undertake, especially as these investments are often conditional on periods of favourable seasons. The reduced frequency of these seasons could inhibit some capital replacement or expansion decisions of farmers. Where climate change is not rapid then farmers’ traditional responses to climate variability (John 2005, Kingwell et al. 1993) in broadacre farming in Australia are likely to facilitate their effective adaptation to climate change. This is because accompanying and underlying climate change will be the continued stochasticity of weather-year variation. It is this variation that typifies the environment of much of Australian agriculture and occupies the minds and talents of many farmers on an annual basis. Although climate change will lead to the eventual alteration in the frequencies of weather-year types, it is farmers’ abilities to respond to climate variation, rather than climate change per se, that is likely to serve them best in the short and medium term. Already Australian broadacre farmers commercially display abilities to successfully respond to existing climate variation, as can be illustrated with the following farm panel data. Farm records of 59 broadacre farm businesses operating in the southern agricultural region of Western Australia from 1995 to 2002 reveal that these farmers on average increased their net worth and farm profits, in spite of experiencing trends of declining growing season rainfall, higher average daily temperatures and more evaporation during the growing season (see Table 2). for n enterprises, each having a land share of s.
This region has been described as already probably being subject to adverse climate change (Sadler 2002, ACG 2005). Over the period 1995 to 2002 the farmers altered enterprise diversification with shifts in the relative importance of various enterprises between years. On average over the period farms became more crop dominant with the average percentage of farm in crop increasing from 46 to 55 per cent, yet stocking rates per winter-grazed hectare were almost unchanged. Moreover, enterprise diversification, as measured by an inverse Herfindahl index of land allocation, increased suggesting that greater diversification occurred. Data on the mix of crops shows that although more land was allocated to crops during the period the switch was not solely into wheat production but rather more canola, in particular, was grown. Hence, although there was a switch in land use toward cropping, nonetheless the mix of enterprises, in terms of land allocation on the farms, increased on average. Accompanying the strategic decision to switch more land into cropping was a maintained tactical flexibility to adjust the mix and area sown to the various crops on an annual basis. On average, the farms each year adjusted the percentage of their farm in crop by 8.8 per cent. However, there was variation between farms and across years in the extent to which inter-year adjustment of crop area was made. For example, in 1996 on average farms altered the percentage of farm in crop by 12.2 per cent compared to only 6.1 per cent in 2002. The median change to crop area was less than the mean, indicating that a smaller proportion of farms made large alterations to the size of their cropping programmes. By illustration, 10 per cent of farms on average annually adjusted their crop area by 19% of their farm’s arable area whereas another 40 per cent of farmers adjusted their crop area by only up to 4.3% of their farm’s arable area. The indicators of farm performance in Table 2 are only for an 8 year period, far too short to illustrate conclusively farmers’ ability to respond to climate change. However, it does suggest that in a drying and warmer period such as occurred during 1995 to 2002, farmers in that region were able to respond profitably to the sequence of weather-years they faced. Whether those same farmers could continue to improve farm profitability, if the same rate of warming and drying continued over the next 8 years, is unknown. At some point the deterioration in environmental conditions would constrain farm profitability. However, the evidence thus far is that these farmers have been able to generate higher profits during a warmer, drier period. Australian farmers, on average, are well-placed to respond to climate change; having access to R&D innovation, agribusiness services, education services, modern infrastructure, a range of marketing and storage systems, and are well-served by financial markets. By contrast some developing countries do not have access to a similar quality or quantity of resources and they appear vulnerable. For example, Fischer et al. (2002) describe outputs from three major global climate models that all produce similar adverse projections for Africa. Presently, there are 1,080 million hectares of land in Africa with a length of growing period of less than 120 days. Climate change toward the 2080s is projected to expand this land by about 5 to 8 per cent, equivalent to 58 million and 92 million hectares respectively. This expansion of arid areas is accompanied by a projected contraction of 31 to 51 million hectares of favourable growing zones of 120 to 270 days. More than 180 million people currently live in these vulnerable environments and a majority relies on agriculture for their livelihood. Although Australian farmers are, compared to many farmers in some developing countries, well-resourced to respond to climate change they are not financially cushioned or supported by government policy to the degree enjoyed by many North American and European farmers. The farm sector in Australia, broadly speaking and especially when compared to other major agricultural exporting nations, receives relatively little financial support from transfer payments, tariffs and subsidies. The OECD (2005a) report that economic assistance to Australian agriculture (as a per cent of gross farm receipts) was around 4 per cent in 2003, markedly lower than the OECD average of 32 per cent. The Australian agricultural sector has an effective rate of assistance of around 4 per cent of industry gross value added, including budgetary, tariff and regulatory assistance (Productivity Commission 2005). The OECD (2005b) also report that support to arable crop producers in OECD countries amounted to $US62 billion in 2001-03, accounting for 39 per cent of farm receipts from crops. Vocke et al. (2005) report on government assistance to US wheat producers and note that, without government payments, only 18 per cent of specialized wheat farms had farm revenue greater than economic costs in 2003. Inclusion of government payments enabled the percentage of farms with revenue greater than economic costs to rise to 31 per cent. US government payments in 2003 averaged $US17,000 per specialized wheat farm or nearly 20 per cent of their average gross cash income of $US94,000. By contrast to their North American and European counterparts, the implication for Australian farmers is that their future prosperity, like their recent past, is unlikely to lie in extracting rent via the political economy. Rather it is farmers’ abilities to generate profit streams largely devoid of government assistance that will need to remain the focus of their business activity. It seems unlikely that governments will offer much climate-change related assistance to farmers, apart from natural disaster relief (see Table 3) and R&D support. Farmers mostly will need to be self-reliant and to adapt to climate change and its associated climatic and commodity price variability. Occasionally climate change impacts in rural areas of Australia will surface as national issues; mostly through natural disaster impacts of the climate variability associated with climate change. Pittock (2003a), for example, points out that bush fires are likely to become more prevalent in southern Australia due to climate change. He also suggests that the frequency of other extreme events such as floods and destructive winds will increase. Under current climatic conditions bushfires, floods and severe storms account for over 60 per cent of the average annual cost of natural disasters in Australia (see Table 3). The national average annual cost of natural disasters is over a billion dollars. Admittedly many of these costs are incurred in metropolitan and regional centres rather than on farmland. However, climate change is likely to raise costs of natural disasters across the board, in rural and urban areas. a Excludes death and injury costs. Source: BTE (2001). Because the future profitability of many farm businesses will depend on their ability to respond to climate change and its associated climate variability, part of the way forward for farmers will be to ensure their capacity to adapt is not impaired. Hence, there will be an on-going need for R&D and innovation that ensures farmers have a maintained capacity to profitably engage in farm production in the face of an environment often less conducive to agricultural production. In the face of climate change, particularly where it is rapid, the value of knowledge from climate-related regionally-specific R&D will be eroded, increasing uncertainty surrounding farmers’ decision-making. In some cases this previous or existing knowledge could be a stranded asset where it may be increasingly relevant to another region yet the means to credibly transfer the knowledge may be lacking. In the presence of climate change, farmers’ need for regionally-relevant climate-related R&D and innovation is likely to increase due to the erosion of the value of previous knowledge and innovation. Some R&D, particularly long-run R&D, may need to be anticipatory whereby the R&D is assessed for an environment that is likely to unfold, rather than for present climatic conditions. For example, it may be possible to anticipate the sorts of weed, pest and disease problems that could emerge with climate change and so R&D to facilitate farmers’ future responses to these problems may be strategically valuable R&D. where large and long lived investments are being made — such as in dedicated irrigation systems, slow growing vulnerable plantation species and processing facilities (ACG 2005). It is unlikely that adaptation responses in all cases will successfully shield these farms and regions from the adverse consequences of climate change. Depending on policy changes and emergence of more lucrative markets for environmental services, the general nature of farming in the face of climate change may alter. In the future it is conceivable that farmers will have a greater role in both reducing greenhouse gas emissions on their farms and abating emissions of others through provision of farmland for carbon sinks. Water shortages may mean that some farms, particularly in southern regions of Australia, may be leased or acquired for their catchment services. Some farmers may play a role in establishing wildlife corridors that traverse isohyets and isotherms to expedite the movement of native species and reduce the likelihood of species extinction or endangerment due to climate change. Probably policymakers will adopt a triage approach to species protection where funds will go to regions and locations with significant biodiversity that can be cost-effectively protected from adverse climate change and its associated variability. However, for most farmers the way forward will be much the same as in the past; creating a living amidst climate, price and social challenges. As Malcolm (2000, p. 40) observes: ‘A glance through history suggests that in the most important ways, the fundamental elements of managing a farm have altered little’. Successful farm management will continue to depend on good decisions about the farm’s enterprise mix, machinery replacement, land leasing or purchase, labour hiring, and off-farm investments. Was Hanrahan right? Will Australian farmers be ruined by the cumulative adverse impacts of climate change and its associated variability? Although abrupt, catastrophic and largely irreversible events are possible outcomes of some climatic change scenarios, most analysts and commentators suggest they are most likely to be distant events of low probability, unlikely to affect let alone ruin the next few generations of farmers. Climate change in rural regions of Australia, at least in the next couple of decades, is more likely to produce a diverse set of spatial impacts. Many traditional agricultural regions are likely to face a more challenging environment for crop, pasture and animal production. In broadacre farming the prospects are for warmer and drier conditions and an increased likelihood of more extreme events such as drought, fire, excessive summer heat and severe storms. In some regions the alteration in climate poses significant business challenges, with strong downward pressure being exerted on farm incomes. Fortunately climate change is likely to unfold on a time scale long enough to facilitate adaptation responses of farmers and to permit creation of knowledge and innovation that may ameliorate potential adverse impacts of climate change. Moreover, the nature of farm businesses in Australia already has been fashioned by climate variability, so many businesses are now structured to cope with gradual climate change and its associated climate variability. In general, farms are diversified, with high equity, are reliant on new technologies and agribusiness services and are strongly market-focused. Many farms also have off-farm sources of income or sizeable off-farm investments. These characteristics support farmers’ adaptation responses to climate change and its associated variability. The unfolding nature of climate change does mean that farmers’ reliance on regionally-relevant, climate-related, anticipatory R&D will increase. In many regions farmers will need access to knowledge and innovation that assists them to ameliorate the adverse impacts of climate change. In other, often more northerly, regions where the prospects for agricultural production may improve due to climate change, knowledge and innovations that allow farmers to capitalize on unfolding more favourable conditions also will be required. Climate change will complicate farmers’ and other investors’ decisions regarding large and long lived investments whose returns are climate-dependent. Some investments in agro-forestry, salinity prevention, viticulture, tree crop plantation establishment, irrigation infrastructure, road and rail capital works and biodiversity preservation are likely to become problematic in the face of climate change. Assessing the vulnerability of these investments to adverse or favourable impacts of climate change will be both a scientific and economic challenge. AAG (2001) The enhance greenhouse effect and its impact on agriculture: an Australian perspective. Information paper, pp.11. ACG (2005) Climate Change Risk and Vulnerability, A report by the Allen Consulting Group commissioned by the Australian Greenhouse Office, Department of Environment and Heritage, Canberra, pp. 159. Alexander, F, and Kokic, P. (2005) Productivity in the Australian grains industry, ABARE Report 05.3, prepared for the Grains Research and Development Corporation, Canberra, pp.50. Alston J.M. and Pardey, P.G. (2001) Attribution and other problems in assessing the returns to agricultural R&D. Agricultural Economics 25(2-3): 141-152. Asseng, S., Jamieson, P., Kimball, B., Pinter, P., Sayre, K., Bowden, J. and Howden, S. (2004) Simulated wheat growth affected by rising temperature, increased water deficit and elevated atmospheric CO2. Field Crops Research 85: 85–102. AGO (2002) Living with Climate Change: An Overview of Potential Climate Change Impacts on Australia, Australian Greenhouse Office, Canberra. Ash, A. J., P. O’Reagan, P. McKeon and M. Stafford-Smith. (2000) Managing climate variability in grazing enterprises: a case study of Dalrymple Shire, north-eastern Australia. In: G.L. Hammer, N. Nichols and C. Mitchell (eds. ), Application of Seasonal Climate Forecasting in Agricultural and Natural Ecosystems. Dordrecht: Kluwer, pp. 253-270. Ausubel, J.H. (1983) Historical Note, In Changing Climate, National Research Council, pp.488-491, National Academy Press, Washington. Azar, C. and Lindgren, K. (2003) Catastrophic events and stochastic cost-benefit analysis of climate change. Climatic Change 56: 245-255. Baranzini, A., Chesney, M. and Morisset, J. (2002) The impact of possible climatic catastrophes on global warming policy. Energy Policy 31: 691-701. Bari, M.A., Smettem, K.R.J. and Sivapalan, M. (2005) Understanding changes in annual runoff following land use changes: a systematic data-based approach. Hydrological Processes 19(13):2463-2479. Beer, T. and Williams, A. (1995) Estimating Australian forest fire danger under conditions of doubled carbon dioxide concentrations. Climatic Change 29: 169-188. BTE (2001) Economic Costs of Natural Disasters in Australia. Bureau of Transport Economics, Canberra. Cary, G.J. (2002) Importance of changing climate for fire regimes in Australia. pp. 26-46. In: (Bradstock, R.A., J.E. Williams and M.A. Gill, (eds. )), Flammable Australia: The Fire Regimes and Biodiversity of a Continent, Cambridge University Press, Cambridge UK, pp. 455. Cline, W. R. (1992) The Economics of Global Warming, Institute for International Economics, Washington, DC. pp.399. Crimp, S.J., Flood, N.R., Carter, J.O., Conroy, J.P. and McKeon, G.M. (2002) Evaluation of the Potential Impacts of Climate Change in Native Pasture Production – Implications for Livestock Carrying Capacity. A report to the Australian Greenhouse Office, Canberra. Davison, T., McGowan, M., Mayer, D., Young, B., Jonnson, N., Hall, A., Matschoss, A., Goodwin, P., Coughan, J. and Lake, M. (1996) Managing Hot Cows in Australia. Queensland Department of Primary Industries, Brisbane, Australia, pp.58. DEP (2004) Climate Change, Catchment Runoff and Risks to Water Supply in the South-West of Western Australia, Department of Environment, Government of Western Australia, pp. 43. Fagan, B. (2004) The Long Summer: How Climate Changed Civilization, Basic Books, New York, pp.284. Finch, V.A., Bennett, I.L. and Holmes, C.R. (1982) Sweating response in cattle and its relation to rectal temperature, tolerance of sun and metabolic rate. Journal of Agricultural Science 99: 479-487. Finch, V.A., Bennett, I.L. and Holmes, C.R. (1984) Coat colour in cattle: effect on thermal balance, behaviour and growth, and relationship with coat types. Journal of Agricultural Science 102: 141-147. Fischer, G., Shah, M. and van Velthuizen, H. (2002) Climate Change and Agricultural Vulnerability. A special report, prepared by the International Institute for Applied Systems Analysis under United Nations Institutional Contract Agreement No. 1113, pp.152. Fuhrer, J. (2003) Agroecosystem responses to combinations of elevated carbon dioxide, ozone and global climate change. Agriculture, Ecosytems and Environment 97: 1-20. Godden, D. and Adams, P.D. (1992), The enhanced greenhouse effect and Australian agriculture, chapter 17, pp. 311-331, in J.M. Reilly and M. Anderson (eds), Economic Issues in Global Climate Change: agriculture, forestry, and natural resources, Westview Press, Boulder. Hall, W.B., McKeon, G.M. Carter, J.O. Day, K.A. Howden, S.M. Scanlan, J.C. Johnston, P.W.and Burrows, W.H. (1998) Climate change and Queensland's grazing lands, II: an assessment of impact on animal production from native pastures. Rangeland Journal 20: 177-205. Hood, A., Hossain, H., Sposito, V., Tiller, L. Cook, S., Jayawardana, C., Ryan, S., Skelton, A. Whetton, P. Cechet, B. Hennessy, K. and Page, C. (2002) Options for Victorian agriculture in a “new” climate – a pilot study linking climate change scenario modelling and land suitability modelling. Volume One – Concepts and Analysis. 62 pp. Volume Two – Modelling Outputs. 83 A3 pp. Department of Natural Resources and Environment – Victoria, June 2002. Howarth, R.B. (2003) Catastrophic outcomes in the economics of climate change. Climatic Change 56: 257-263. Howden, M. and Hayman, P. (2005) The distribution of cropping under climate change: Goyder’s line. Contributed paper presented at the conference Greenhouse2005, Carlton Crest Hotel, Melbourne, 14-17 Nov, 2005. Howden, S.M., McKeon, Walker, L. Carter, J.O. Conroy, J.P. Day, K.A. Hall, W.B. Ash, A.J.and Ghannoum, O. (1999) Global change impacts on native pastures in southeast Queensland, Australia. Environmental Modelling and Software 14: 307-316. Howden, M., Ash, A., Barlow, S., Booth, T., Charles, S., Cechet, R., Crimp, S., Gifford, R., Hennessy, K., Jones, R., Kirschbaum, M., McKeon, G., Meinke, H., Park, S., Sutherst, R., Webb, L. and Whetton, P. (2003) An overview of the adaptive capacity of the Australian agricultural sector to climate change – options, costs and benefits. CSIRO Sustainable Ecosystems, Canberra. Howden, S. M. (2003) Climate variability and climate change: challenges and opportunities for farming an even more sunburnt country. In Proceedings of the National Drought Forum. Brisbane, Queensland: Department of Primary Industries, pp. 42-46. Howden, S. M., Hall, W.B. and Bruget, D. (1999b) Heat stress and beef cattle in Australian rangelands: recent trends and climate change. In: People and Rangelands: Building the Future. Proceedings of VI International Rangelands Congress, Townsville, July, 1999. [Eldridge, D. and D. Freudenberger (eds.)]. 6th International Rangelands Congress Inc., Aitkenvale, Queensland, Australia, pp. 41-43. Howden, S. M. and Meinke, H. (2003) Climate change: challenges and opportunities for Australian agriculture. In: Proceedings of the Conference on Climate Impacts on Australia's Natural Resources: Current and Future Challenges, Queensland, Australia, Canberra: Standing Committee on Natural Resource Management. Managing Climate Variability Program, pp. 53-55. Howden, S.M. and Turnpenny, J. (1997) Modelling heat stress and water loss of beef cattle in sub-tropical Queensland under current climates and climate change. In: Modsim ’97 International Congress on Modeling and Simulation, Proceedings, 8-11 December, University of Tasmania, Hobart [McDonald, D.A. and M. McAleer (eds.)] Modelling and Simulation Society of Australia, Canberra, Australia. 1103-1108 pp. IOCI (2002) Climate Variability and Change in South West Western Australia, Perth. Indian Ocean Climate Initiative. IOCI (2005) Summary of key findings. Indian Ocean Climate Initiative Bulletin No. 6, August, 2005, Perth, pp.4. IPCC (2001a) Third Assessment Report – Climate Change 2001. Intergovernmental Panel on Climate Change, Cambridge University Press. IPCC (2001b) Climate Change 2001: The Scientific Basis. Contribution of Working Group I to the Third Assessment Report of the Intergovernmental Panel on Climate Change (Houghton, J.T.,Y. Ding, D.J. Griggs, M. Noguer, P.J. van der Linden, X. Dai, K. Maskell, and C.A. Johnson (eds.)). Cambridge University Press, Cambridge, United Kingdom and New York, NY, USA, 881pp. John, M., Pannell, D. and Kingwell, R. (2005) Climate change and the economics of farm management in the face of land degradation: Dryland salinity in Western Australia. Canadian Journal of Agricultural Economics 53: 443–459. John, M. (2005) The Economics of Dryland Salinity Management in a Low-Rainfall Environment of Western Australia. PhD thesis. Perth: University of Western Australia. Jones, R.N. (2001) An Environmental Risk Assessment/Management Framework for Climate Change Impact Assessments, Natural Hazards, vol 23. Jones, R. (2003) Managing climate risks. Paper prepared for the OECD workshop on The Benefits of Climate Change: Improving Information for Policy Makers, 12-13 December, 2002, Paris, pp.37. Julia, R. and Duchin, F. (2005) World Trade as the Adjustment Mechanism of Agriculture to Climate Change, Department of Economics, Rensselaer Polytechnic Institute, New York, Working Paper in Economics No. 0507, May 2005, pp.34. Keller, K., Tan, K., Morel, F.M. and Bradford, D.F. (2000) Preserving the ocean circulation: implications for climate policy. Climatic Change 47: 17-43. Kingwell, R. and Pannell, D. (2005) Economic trends and drivers affecting the wheatbelt of Western Australia to 2030. Australian Journal of Agricultural Research 56:1-9. Kingwell R. S., D. J. Pannell and S. Robinson (1993) Tactical responses to seasonal conditions in whole-farm palnning in Western Australia. Agricultural Economics 8: 211-226. Knopke, P., O’Donnell, V. and Shepherd, A. (2000) Productivity Growth in the Australian Grains Industry, ABARE Research Report 2000.1, Canberra. Kokic, P., Heaney, A., Pechey, L., Crimp, S. and Fisher, B. (2005) Climate change: predicting the impacts on agriculture: a case study. Australian Commodities 12(1): 161-170. Littleboy, M. and McKeon, G.M. (1997) Sub-routine GRASP: Grass Production Model, Documentation of the Marcoola version of subroutine GRASP, Appendix 2, Evaluating the Risks of Pasture and Land Degradation in Native Pasture in Queensland, Final report for RIRDC, project DAQ124A. Malcolm, B. (2000) Farm management economic analysis: A few disciplines, a few perspectives, a few figurings, a few futures. Invited paper to the 44th Annual Conference of Australian Agricultural and Resource Economics Society, Sydney, 22-25 January, 2000. Martin, P. King, J-A, Puangsumalee, P., Tulloh, C. and Treadwell, R. (2005) Australian farm survey results: 2002-03 to 2004-05. Australian Bureau of Agricultural and Resource Economics, Australian Farm Survey Results, March, 2005. pp.1-26. Mauzerall, D. L. and Wang, X.: (2001) Protecting agricultural crops from the effects of tropospheric ozone exposure: Reconciling science and standard setting in the United States, Europe, and Asia, Annual Review of Energy Environment 26: 237-268. McCown, R. L., Hammer, G.L., Hargreaves, J. N. G., Holzworth, D. L. and Freebairn, D. M. (1996) APSIM: A novel software system for model development, model testing and simulation in agricultural systems research. Agricultural Systems 50: 255-271. McCuen, R. H. (1982) A Guide to Hydrologic Analysis Using SCS Methods, Prentice Hall, Inc. Englewood Cliffs, New Jersey. McInnes, K.L., Whetton, P.H., Webb, L. and Hennessy, K.J. (2003) Climate change projections for Australian viticultural regions. The Australian and New Zealand Grapegrower and Winemaker, February 2003, 40-47. McKeon, G.M., Rickert, K.G., Ash, A.J., Cooksley, D.G. and Scattini, W.J. (1982) Pasture production model, Proceedings of the Australian Society of Animal Production 14: 202-204. McKeon, G.M., Day, K.A., Howden, S.M., Mott, J.J., Orr, D.M., Scattini, W.J. and Weston, E.J. (1990) Management of pastoral production in northern Australian savannas. Journal of Biogeography 17: 255-272. McKibbin, W.J. and Wilcoxen, P.J. (2002) Climate Change Policy After Kyoto: blueprint for a realistic approach, The Brookings Institution, Washington, D.C., pp.133. Meinke, H., Hammer, G.L., van Keulen, H. and Rabbinge, R. (1998) Improving wheat simulation capabilities in Australia from a cropping systems perspective III. The integrated wheat model (I_WHEAT). European Journal of Agronomy 8:101-116. Morison, J.I.L. (1996) Climate change and crop growth. Environmental Management and Health 7(2):24-27. Mullen, J. (2002) Farm management in the 21st Century. Agribusiness Review 10: paper 5, http://www.agribusiness.asn.au/Publications_Review/Review_Vol10/Mullen.htm [accessed 14 July 2005]. Norris, R., Richards, R., Creeper, J., Jubb, T., Madin, B. and Kerr, J. (2003) Cattle deaths during sea transport from Australia. Australian Veterinary Journal 81(3): 156-161. OECD (2005a) Agricultural Outlook, Organisation for Economic Cooperation and Development, Paris. Pardey, P.G and Beintema, N.M. ( 2001) Slow magic: agricultural R&D a century after Mendel, agricultural R&D a century after Mendel, International Food Policy Research Institute, Washington, DC, pp.30. Penuelas, J. and Filella, I. (2001) Responses to a warming world. Science 294: 793-795. Petty, S.R., Poppi, D.P and Triglone, T. (1998) Effect of maize supplementation, seasonal temperature and humidity on the liveweight gain of steers grazing irrigated Leucaena leucocephala/Digitaria erinta pastures in north-west Australia. Journal of Agricultural Science 130:95-105. Petersen, E., Schilizzi, S. and Bennett, D. (2003) The impacts of greenhouse gas abatement policies on the predominantly grazing systems of south-western Australia. Agricultural Systems 78: 369-386. Pittock, B. (2003b) Climate change and Australia's natural resources: A review. In: Proceedings of the Conference on Climate Impacts on Australia's Natural Resources: Current and Future Challenges, Queensland, Australia, Canberra: Standing Committee on Natural Resource Management. Managing Climate Variability Program, pp. 51-52. Productivity Commission (2005), Trends in Australian Agriculture, Research Paper, Canberra, pp. 170. Quiggin, J. and Horowitz, J. (2003) Costs of adjustment to climate change. Australian Journal of Agricultural and Resource Economics 47: 429-446. Reilly, J., Hohmann, N. and Kane, S. (1994) Climate Change and Agricultural Trade: Who Benefits, Who Loses? Global Environmental Change 4(1): 24-36. Reyenga, P.J., Howden, S.M, Meinke, H. and McKeon, G.M. (1999) Impacts of global change on cropping in SW Queensland. Environmental Modelling and Software 14: 297-306. Reyenga, P.J., Howden, S.M., Meinke, H. and Hall, W.B. ( 2001) Global impacts on wheat production along an environmental gradient in south Australia. Environment International 27: 195-200. Rial, J.A., Pielke Sr, R.A., Beniston, M., Claussen, M., Canadell, J., Cox, P., Held, H., De Noblet-Ducoudre, N., Prinn, R., Reynolds, J.F. and Salas, J.D. (2004) Nonlinearities, feedbacks and critical thresholds within the earth’s climate system. Climatic Change 65: 11–38. Rosenzweig, C. and Parry, M.L: (1994) Potential impacts of climate change on world food supply. Nature 367: 133–139. Soil Conservation Service (1986) Urban Hydrology for Small Watersheds, Technical Release 55 (TR-55). Stocker, T.F. and Schmittner, A. (1997) Influence of CO2 emission rates on the stability of the thermohaline circulation. Nature 388: 862-865. Tol, R.S.J. (2003) Is the uncertainty about climate change too large for expected cost-benefit analysis? Climatic Change 56: 265-289. Van Ittersum, M. K., Howden, S.M. and Asseng. S. (2003) Sensitivity of productivity and deep drainage of wheat cropping sytems in a Mediterranean environment to changes in CO2, temperature and precipitation. Agriculture, Ecosystems and Environment 97: 255-273. Vocke, G., Allen, E.W.and Ali, M. (2005) Wheat backgrounder. Electronic Outlook Report from the Economic Research Service Wheat Backgrounder / WHS-05k-01. Vellinga, M. and Wood, R.A. (2002) Global climatic impacts of a collapse of the Atlantic thermohaline circulation. Climatic Change 54: 251-267. Wheeler, T. R., Batts, G.G., Ellis, R.H., Hadley, P. and Morison, J. I. L. (1996) Growth and yield of winter wheat crops in response to CO2 and temperature. Journal of Agricultural Science 127: 37-48. White, N., Sutherst, R.W., Hall, N. and Whish-Wilson, P. (2003) The vulnerability of the Australian beef industry to impacts of the cattle tick (Boophilus microplus) under climate change. Climate Change 61(1-2):157-190. Williams, A.J., Karoly, D.J. and Tapper, N. (2001) The sensitivity of Australian fire danger to climate change. Climatic Change 49: 171-191.